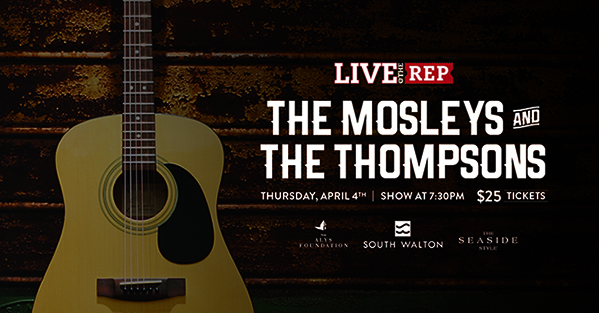 Local favorites The Mosleys, Will Thompson and Lindsey Thompson unite for an unforgettable evening of powerful music at The REP Theatre! 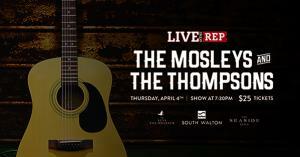 From The Mosleys' folk roots to Will Thompson’s rockin’ country tunes and Lindsey Thompson’s sweet melodies there is something for everyone in this special Live@TheREP Concert. Calling Northwest Florida home, these talented artists bring a passion for music and storytelling to the stage like no other. With The REP’s intimate venue and low-key atmosphere, live music has the perfect home on 30A, giving both audiences and musical guests an experience that you cannot find anywhere else.